POHANG /the Republic of Korea/, November 8. /TASS/. 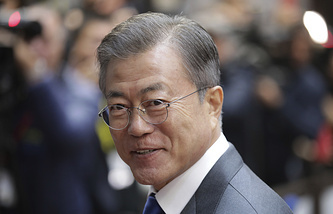 The Republic of Korea will work to create a basis for trilateral economic cooperation with Russia and North Korea, South Korean President Moon Jae-in said during the first Russian-Korean Summit on Interregional Cooperation that was held on Thursday in the city of Pohang.